According to the American Heritage Dictionary, to prattle is “to talk or chatter idly or meaninglessly; babble or prate.” (And you, dear reader, already are thinking that this is going to be a bad review. Patience, s’il te plaît.) 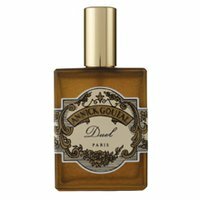 Annick Goutal’s singularly impressive Duel, conceived by Isabel Doyen in collaboration with Annick’s daughter Camille, constellates its elements –– birch tar, green maté leaf absolute, Paraguay seed, orris, and musk –– around a dusky violet heart. It is a strange effect, to say the least; strange but not unwelcome. Indeed, Duel is a misnomer of sorts; for the fragrance transports me not to a scene of drawn pistols at dawn, but, rather, to the slapping of gloves that preceded it. Duel reeks of the libertine and his illicit “freedoms,” the panoply of liberties he’s taken with his rivals’ sweethearts. His britches make the ladies (and a few of the footmen) swoon, while gentlemen of his rank and station affect quizzical expressions at the violet spray in his lapel. Rumor has it, he’s no shrinking violet. Leather in summer. Sounds like the title of a German mountain film or an avant-garde poem from the Weimar Republic. Inevitably, these are the words that come to mind when I think of Parfums d’Empire Cuir Ottoman. For some reason, here I am reminded of Etat Libre d’Orange Jasmin et Cigarette. It inhabits an olfactory space where delicacy vies with debauchery. While one is a leather scent and the other a tobacco scent, they allow us a casement-view into their twinned identities. And, often, I have found them appealing to the same noses. The genius of Jasmin et Cigarette is the amped-up, fruity jasmine. Bananas and Beaujolais. 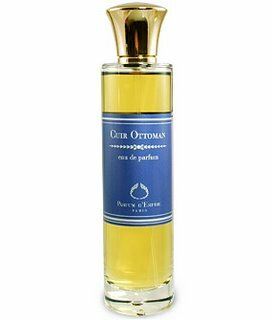 The genius of Cuir Ottoman is the double-caress of Indian and Egyptian jasmine absolute and cool, powdery orris in its disjointed-yet-instantly-appealing heart. Like Jasmin et Cigarette, Cuir Ottoman eschews the indolic, sweaty-body aspect of jasmine for something pretty but not prettified. After a while, Cuir Ottoman sticks close to its leather base. It never strays into the bejeweled Orientalist realm but, rather, remains Parisian through and through. For those who would find themselves seduced merely by the name, a caveat: this is not Serge Lutens territory. The Ottoman Empire minus the hair and the ointments and the camel dust. Think of Proust’s “petite bande” on the boardwalk at Balbec transformed into a band of enchanted lederhosen-clad Bavarian youth—Hedi Slimane-thin––beholding the Golden Horn and the minarets of Sultanahmet for the very first time. Vetiver (Chrysopogon zizanioides) is a material of aristocratic mien but humble means. Used to stanch water erosion in the tropics, vetiver traditionally has been utilized in everything from window shades to grass mats. The dried roots resemble a tangle of vermicelli and possess a intoxicating sweet-smoky-woody-earthy aroma touched with a nose-tingling bitterness and a bit of licorice. Vetiver has been the subject of many a post on Vetivresse, and understandably so. The market seems to have reached vetiver saturation, with more than a handful of very pleasant renditions available. The venerable house of Chanel has recently entered the fray with Sycomore, a Sheldrake-Polge collaboration, which, if I were to give vetiver advice to a fragrance neophyte, would fall high on my short list of benchmark vetivers. While it bears little resemblance to its forebear, Chanel’s 1930 version, it is dark and smoky and sophisticated: a welcome anodyne to the present surfeit of bland men’s colognes. Sycomore is a dashing sports car of scents, tuxedo black with touches of glinting eighteen-karat gold and a little splash of mud on the fender. It possesses better-than-average sillage and tenacity, and, in its behemoth atomizer, is vetiver enough to sustain you for a couple of years. For a second there, I thought I would subtitle this review “When Natural Just Isn’t Enough.” (Well, I guess I just did.) 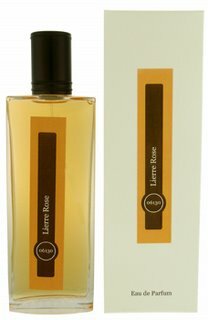 Lierre Rose (the name means “Ivy-Rose”) was created in 2007 by Jacques Chabert, uncle of Nicolas Chabert the founder of Grasse-based Parfums 06130. Chabert worked with Jacques Polge on the EDP update of Chanel Cristalle and with Jean-Paul Guerlain on Samsara (1989). His Lierre Rose for 06130 is a pretty enough rose, which in no exaggeration reminds me of the smell of a newish bathroom in a Cote d’Azur luxury high-rise. It succeeds in making high-quality natural materials smell mundane, even cheap. This is disconcerting for a brand that seemingly prides itself on remaining outside the beck and call of the vast mass-market middle ground; for that same middle ground is what enabled Chabert to make a name for himself in the first place. Lierre Rose starts out with something interesting: a slightly camphorous cardamom note playing counterpoint to an intoxicating tuberose-rose-violet triad. But all too quickly it gets muddled, where one or more of the elements should stand out. I wish it would have been the greener, earthier aspect of the Grasse violet absolute, but instead it’s just a sort of creamy floral fuzzfest dusted with jasmine. Where there could have been boldness, sultriness even, there’s scented-candle insufferableness. Lierre Rose had my hopes up, but ultimately she just turned out to be a pretty girl who wouldn’t leave the bathroom. $145 for a peck on the cheek? She should have been chypre. 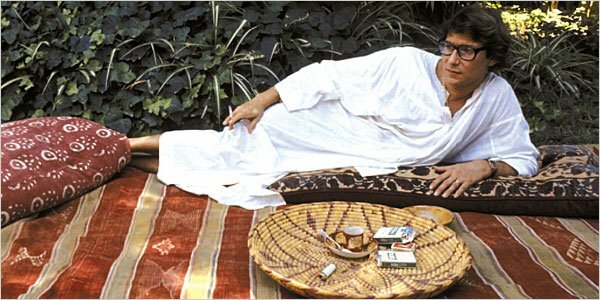 Yves Saint Laurent lived his life as in a dream. And for forty years he succeeded in giving the world a privileged glimpse of what he saw each day in that lush and, often, dangerous place. He represented la belle France’s uneasy relationship with her colonial past, even as he lusted for the charms of an even earlier colonial era (that of his decadent forebears, Flaubert and Pierre Loti). Likewise, he craved the very things that a provincial upbringing kept at arm’s length: exceptionalism and cultural subversion. He embodied both Schéhérazade and her Sultan – the sentence of death commuted, then reinstated by his whim: the sentence becoming, like the sentence of YSL’s beloved Proust, a golden thread sewn onto our living hearts. So what shall it be to acknowledge the master’s leave-taking? Champagne or a little Opium? Here’s to you, M. Laurent.